SPE Australia Contracting Services utilise a large range of SPE equipment for the highest standard of dust free surface preparation..
Dust free captive shot blasting is a technique where small steel shot is propelled at speed onto the asphalt / concrete surface, removing deeply embedded surface contaminants, dirt and grit. This environmentally friendly process restores the surface texture without damaging the surface structure with speed and efficiency. 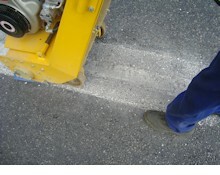 Dust free captive blasting or surface planing techniques can be used to remove line markings on concrete and asphalt surfaces on road surfaces, airport runways or car park surfaces for example. 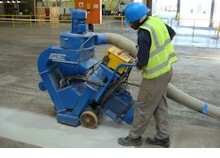 This common task on concrete surfaces is primarily achieved using dust free, environmentally friendly captive shot blasting techniques. A keyed surface also results for the application of thick coatings if required. 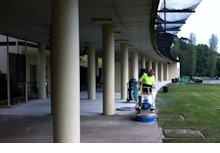 Captive shot blasting is also the method of choice for removing laitance on newly laid concrete surfaces. 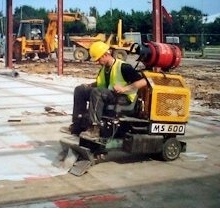 A necessary process when performance has degraded and the anti skid surface is to be renewed or removed altogether. This can be achieved using surface planing techniques; often be quicker and more cost effective than using more complex levelling compounds. For accurate detail, surface grinding may be used. Used to prepare surfaces for thin coating applications or the grinding of surfaces to a fine polished finish.